PT Distinction has integrated My Fitness Pal (MFP). 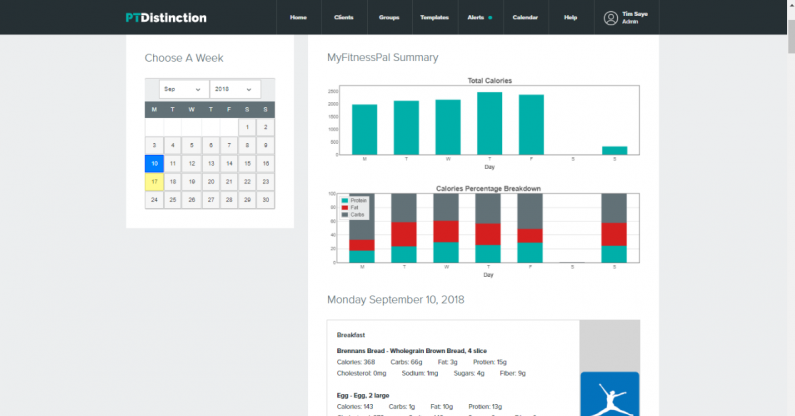 This is a full integration which includes all of your clients foods as well as summaries of each meal, day, and week with breakdowns of their calorie and macronutrient intake. This 2 minute video shows how to see your clients My Fitness Pal tracking inside PT Distinction. This is a feature that's been requested since 2016 when some personal trainer softwares set up half integrations with My Fitness Pal. It's an idea we liked but held back on due to the limited information the standard MFP integration offers, and the fact it doesn't show the foods and meals your clients are eating. While IIFYM eating can work well, we believe great online trainers need more than just a calorie and macro summary to provide great nutrition coaching. It doesn't take a genius to know eating a bunch of organic red grapes is better for you than drinking a can of Coke but their calories and macros can add up the same. If all you see is a calorie and macro summary you'd never see the choices your clients are making that could be holding back their health and results. This is why we're delighted to be the only online personal training software that offers well educated trainers a full integration of MFP with everything you need to provide first class nutrition coaching. While we're delighted to have this integration many clients find tracking food inside apps such as MFP to be a little difficult. Stats indicate very few manage to do it for more than one week at a time so it can be beneficial to have other options for your clients nutrition tracking. Simple meal photos are a very popular alternative that many clients find easier to provide accurate feedback. Of course we have your back with this as well! This video shows how you can offer options to your clients if they struggle to track in My Fitness Pal. We would like to say a huge thank you to the people at Under Armour and My Fitness Pal who have helped us create something fantastic for educated online trainers. You can test PT Distinction and this great new integration for free here.